City University London's Music Informatics Research Group collaborates with the Stockholm Royal Institute of Technology (KTH) to develop a Facebook music game to assist research. 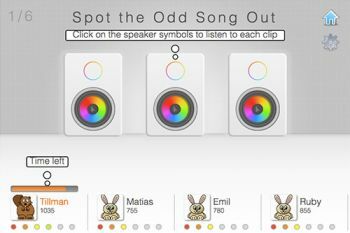 City University London's Music Informatics Research Group has developed the Facebook music game, Spot The Odd Song Out in collaboration with the KTH Royal Institute of Technology, Stockholm. The multi-player game lets players have fun while exploring new music in a variety of styles. Researchers will use the data generated from the game to model and understand the players' perceptions of music similarity, tempo and rhythm. The game is free to play and players can gain rewards for points they earn. "In music exploration and recommendation scenarios we need to understand what users perceive as more or less similar." Daniel Wolff, PhD Student and creator of the game, explores how perceived similarity is influenced by a number of factors such as cultural background, age and education. The research goal is to adapt similarity models to user data and understand the role of these factors. The collaboration with Guillaume Bellec of KTH Stockholm provided for the extension of the game with tempo and rhythm related parts. City's Music Informatics Research Group is a specialized research team within the Department of Computer Science. Music Informatics includes the study of computational methods for music and sound analysis and generation, and music performance. The research interests of the Music Informatics Research Group include music information retrieval and computational musicology, audio transcription, music knowledge representation and music applications such as e-learning and games. The group is also interested in wider aspects of machine learning, sequential structure modelling and audio signal processing, and novel cross-domain application of techniques in these areas. Spot the Odd Song Out can also be played without using Facebook.